Double mattress also known as a full mattress size 54 inches (137.2 centimeters) wide and 75 inches (190.5 centimeters) long with a total space 4050 square feet (26,137 square centimeters). It is 30% bigger than extra long twin size mattress. Double bed is the best suit for medium sizes 12’ x 12’ bedroom consuming only about 20% of it space and leaving enough area for nightstands and other bedroom furniture. It is also can be used in a smaller 10’ x 10’ bedroom, but it might be problematically to accommodate bigger drawers or dressers. With middle by one side placement in 12 x12 feet bedroom it is 45” space left from both side of a double mattress. A full mattress dimension is a smallest standard mattress size designed for two people. Each person have 27” wide or 2025 square feet (1.3 square meter) space and the mattress will be a good choice for two average heights and body proportions adults. Double bed is also much more convenient to transport than other beds for couples. Full size mattress 6 inches narrower and 5 inches shorter what makes it 750 square inches or about 17% smaller than standard queen mattress size. Depending on a mattress type the thickness will range from 5 to 19 inches with a typical 300 – 350 coils count. High quality and performance memory foam full mattress might be 9 – 15 thick plus 4” – 11” base. Full size mattress also much heavier than twin because of bigger dimensions, but it is lighter than any other mattress designed for two adults. Considering family needs and personal preferences double bed might fit perfectly in a bigger master bedrooms allowing much more area for furniture with bigger measurements or getting more wide open space. But if the people are big 27 inches for each might be not enough and it is better to get more spacious mattress such as queen or king size. In UK small double mattress size 4 feet (120 cm) wide and 6’ 3” (190 cm) long (4'0" x 6'3") with a total space 3,600 square feet (22,800 square centimeters). 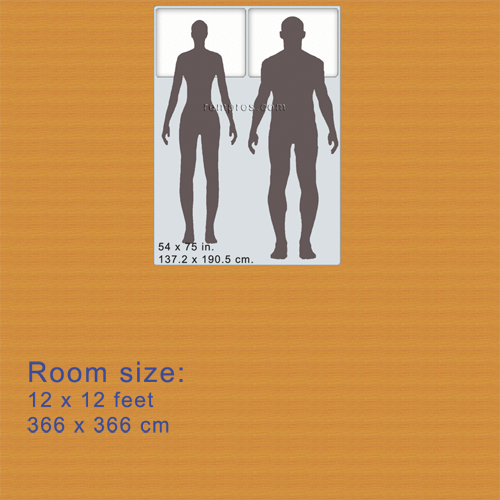 It is rather smaller version of US double mattress rather than its equivalent, but double 4'6" x 6'3" (135 x 190 cm) mattress has a similar measurements.